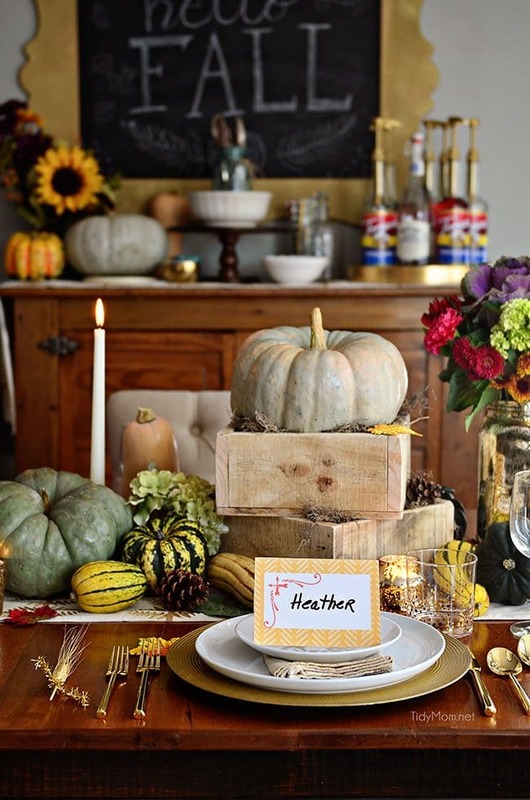 When entertaining, a well-set table doesn’t have to be stressful to look festive and beautiful. 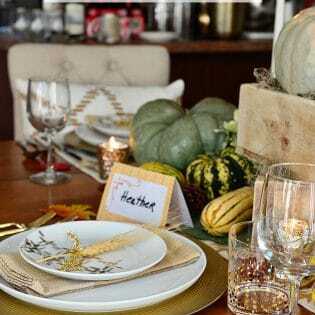 You can add simple touches like gourds, candles, fresh flowers and DIY Laminated Place Cards to personalize your tablescape. 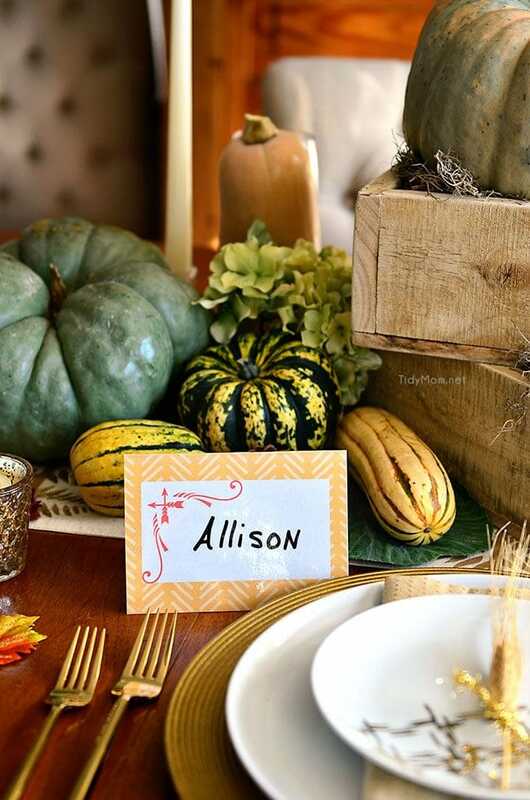 Taking the time to personalize your table with place cards is a great way to make your guests feel welcome and it’s a simple way to make the table feel a little more “fancy”. While laminated place cards may look like they took loads of time to prepare – they only take a few minutes to make, and by laminating them, you can use them over and over again with a dry erase marker! As part of my ongoing partnership with Scotch-Brand, I used the Scotch Pro Laminator to make reusable laminated place cards for our Thanksgiving Table. Press power button on Scotch Pro Laminator, and press the 3 mil setting. Place printable in to Scotch® Thermal Laminating Pouch, do not cut the pouch. When laminator is ready, insert the sealed end of the pouch straight into the laminator. Hold the pouch until the machine pulls it forward. The laminated place card will automatically exit the machine. Do not pull the pouch through the laminator. Remove the pouch after it has stopped moving and allow it to cool on a flat surface. 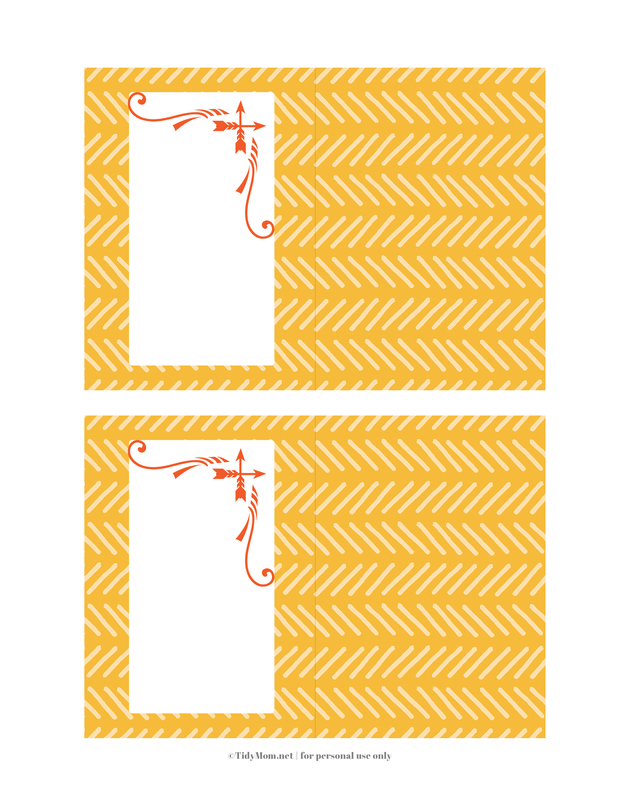 Use scissors to trim the place card to desired size and fold in half. Use the dry erase marker to write dinner guests’ names. Erase and use time and again. I made it even easier for you by creating these simple yellow place cards that will work all year long, for any occasion. Simply click links below to download, print on copy paper. Remember that the best gatherings are those where great conversation, good food, laughter and love happen. Don’t stress about the little things when entertaining, focus on the memories you’re making gathered around a table with those who matter most. Disclaimer: I have a working relationship with 3M Scotch Brand. As always, all views and opinions are my own. Thank you for supporting the brands that make TidyMom possible. What a great idea making the placecards reusable! And this would work for so many different occasions. Very clever! This is such a cute idea, Cheryl, and practical! My favorite combo! This is such a smart crafty idea!! I love that they are mess-free!! What a sweet idea. I love the personal touch. It makes the table setting even more special. Such a creative and easy way to display names for Thanksgiving. What a great idea – love that these are reusable! LOVE this idea! 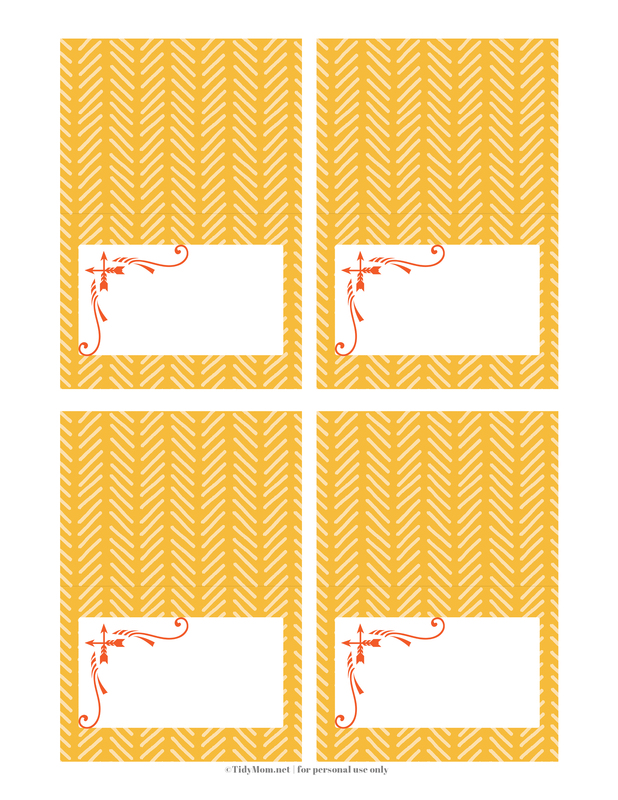 You can color coordinate place cards for any occasion/tablescape! Brilliant! 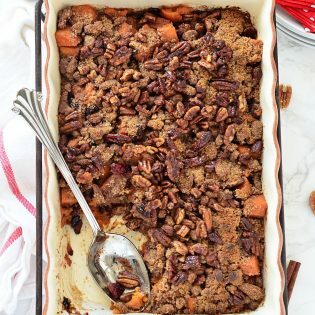 These are just perfect for this season of entertaining family and friends! Love the whole look! There’s just something special about sitting down to your own place card! Happy Thanksgiving to you and yours, Cheryl! I just love this idea. Such an easy and creative way to display names. What a brilliant idea! Love it so much!